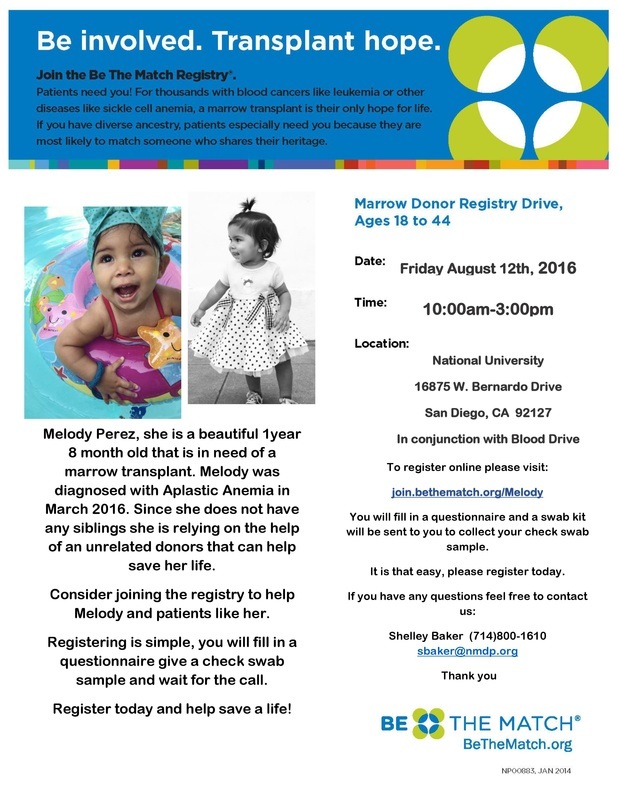 ﻿﻿﻿﻿﻿NUSNA is partnering with the San Diego Blood Bank & Be the Match to host a Blood & Bone Marrow Registry Drive. Help save a life! Donate blood & enter the bone marrow registry. Spread the word & encourage family & friends to donate & register also! Every blood donation & marrow registration counts. ﻿﻿﻿There is a major shortage of blood in the US, & those who require blood are unable to get the treatment they need right away. To learn more, click here. ​Click on the button below to sign up for an appointment to donate blood for quicker service. Walk-ins are also welcome! Please review these tips & reminders before you donate. Don't forget your photo ID! Bring your SD Blood Bank donor ID card if you have one. Maintain your usual eating habits the day of donation. If you're not sure if you can donate, review this information. Help kids, like Melody Perez! Scroll down to read her story. ​﻿Registering is simple! Fill out a questionnaire & get a cheek swab. If you're a potential match, Be the Match will contact you. To learn more about San Diego Blood Bank or Be the Match, click below.